A Domestic. Servant to the Grand Vizier. Ottoman Empire. Home » A Domestic. Servant to the Grand Vizier. Ottoman Empire. A Domestic. Belonging to the Grand Vizier. A Domestic. Servant to the Grand Vizier. UNTIL the reign of the present Sultan, the office of Grand Vizier was not only the most important in the whole state, but was even able to control the sovereign’s will. The three last Viziers have, however, been circumscribed in their power, although their office is still attended with nearly as much pomp and magnificence as formerly. The officers and domestics of the Grand Vizier are very numerous. The portrait here given is of one in his full dress, with his yellow boots and yataghàn, a sort of curved knife or short scimitar. The first of these is reckoned a great privilege, as the common people are forbidden to wear boots or slippers of a yellow colour. The yataghàns, which are also sometimes accompanied by large pistols, are generally very richly ornamented, but without any marks of taste. 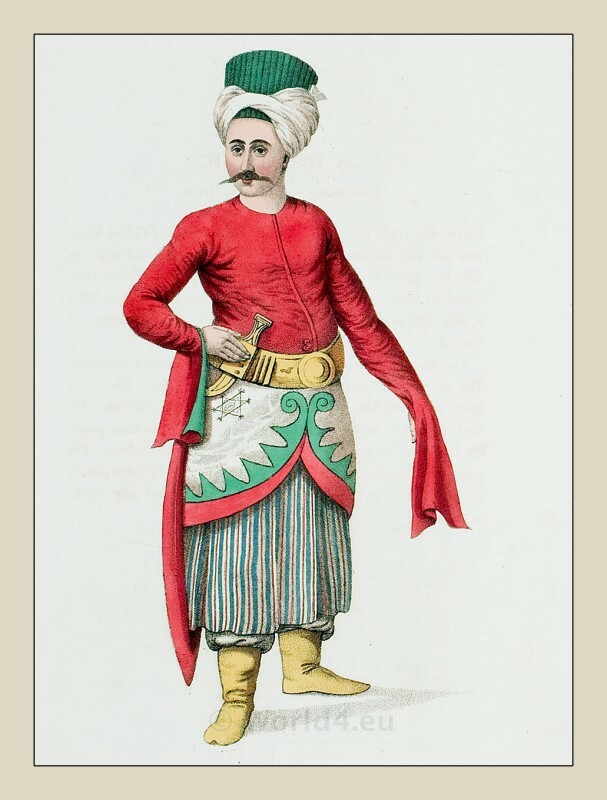 This entry was posted in 1804, 19th Century, Ottoman Empire, Turkey Costumes and tagged Octavian Dalvimart, Ottoman Empire costumes, The costume of Turkey on 3/5/13 by world4.